The long leg of my inbound trip from Newark to Geneva concluded without any significant issues. Yea! And now I’m parked here in Geneva on a layover – having a coffee and a sandwich. Next stop Spain. 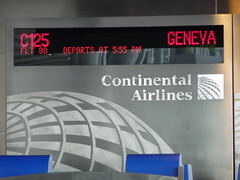 The routing through Geneva is mostly a consequence of how I plan to end the trip. Otherwise, I probably would have just gone directly to Barcelona. My air travel wouldn’t be complete without a weather related delay where we sit parked on the tarmack for awhile and such was the case with the flight to Geneva. Thankfully it was just 45min to an hour. I think I nodded off at one point so I’m not actually sure how long it was. I wasn’t in any hurry though. No impending flight to catch on the other end. But it did make a 7 hour flight into an 8 hour one. We ended up taking off just before sunset and it made for a pretty spectacular view out the window on the way out. The flight was otherwise uneventful – just the way you want it. No matter how you slice it, it’s a long time to sit in one place though. I was flying coach but I had plenty of room to spread out. The flight wasn’t full. I managed to get some decent shut-eye too despite the regular jostling by the folks behind me. I look forward to finishing the endurance test portion of the program and getting in to Spain later in the day – and getting a shower!! Now the real question though: how did the bike fare? I always worry that the luggage is going to make it. I haven’t pulled all the bike stuff out of the bags, but I opened them up and they seem to be ok so far. I had them put “fragile” stickers all over the bags. Not sure it really helps. The hard shell case has at least one spot that looks dented. Not to the point there’s a hole or anything but it definitly took a shot from something. Very glad I had ordered the ‘compression members’ from S&S. They essentially prop up the center of the case. The other bag is soft side. Compression members aren’t really suited to that bag according to what I’ve read. The soft case seems fine. I opened it up. Nothing seems crushed. Hard to tell without more inspection. Guess I’ll get to that later.